One of my favorite things to do in my business is brag about how awesome my clients are! Here on the blog you'll find a lot of that and some pictures. 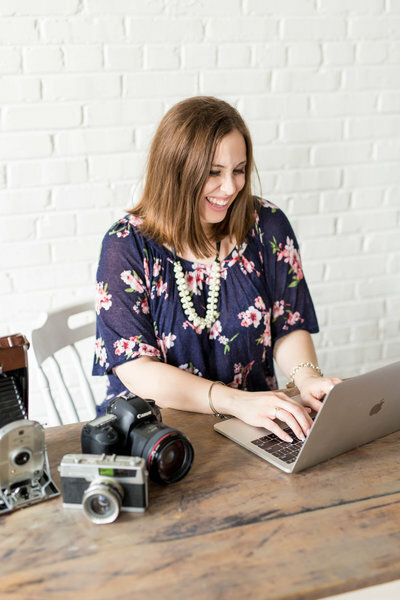 You'll also find personal posts from me, wedding planning tips for brides-to-be, education posts for new photographers, and more! If there are any topics you are interested in learning more about, please let me know! Emily was a dear friend when I was in high school. I remember being in pit orchestra with this gorgeous, kind-hearted woman and laughing with her. She was a year ahead of me, so it was a bummer when she graduated and headed to the University of Maryland for her undergraduate degree. So when Emily got in touch with me about potentially photographing her wedding, I jumped at the opportunity to be around her infectious energy on such a special day in her life. I first met Zacher over brunch and he had me rolling on the floor laughing as he told me their proposal story. I knew immediately that Emily had found an incredible man to stand by her side. That idea was reinforced when, on their big day, Emily read a note from her soon-to-be husband. At first she kept her cool, but as she kept reading, tears started to form, and you can bet I started crying too from the joy of these two sweethearts finally tying the knot! Emily and Zacher, thank you so much for inviting me to photograph your wedding. It was truly an honor to serve you both in this way! I hope you enjoy some of my favorites from the day! This was one of the most groovin’ dance floors of the year! Can’t you feel the excitement and joy?